The skywalk Online Shop is offering three new products for hikers, leisure pilots and XC pilots. The Sassonger Jacket from the skywalk-SALEWA collection is an absolute must for hike&fly pilots. Whether you wear it under your anorak or as an outer layer, the narrowly cut Polarlite jacket with hood will keep your body warm and dry as you hike up and when you’re airborne. 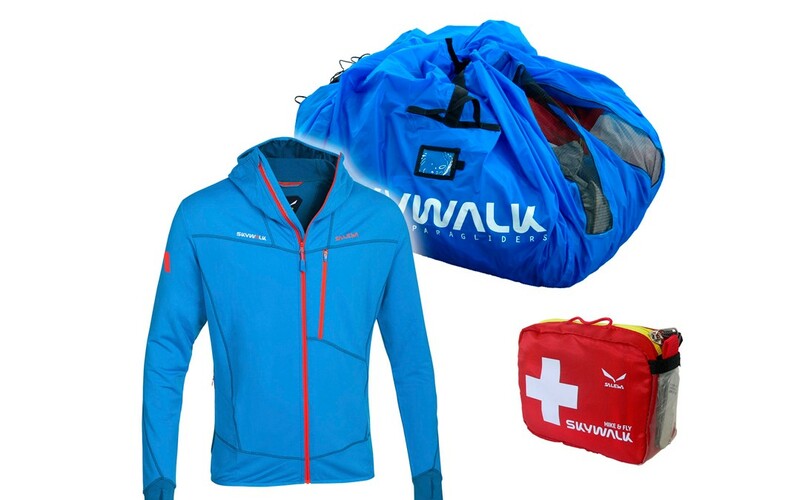 An additional product from the skywalk-SALEWA collection is the new First Aid Kit that contains a rescue blanket, pocketknife, bandages and tick tweezers. With outer dimensions of 12x4x9 cm (LxWxH) this kit will fit into any rucksack! Our Storage Bag is the right choice for frequent flyers who want to pack their glider quickly and carefully without wasting any time to get back to launch. The Storage Bag is available immediately in blue. We hope you enjoy using our new products!